Nina Ottosson Treat Tumble is an interactive game for your dog. This ball bounces and rolls and can be filled with treats. Ideal for rewarding and training your dog. The ball is available in 2 variants. The Treat Tumble from Nina Ottosson is a fun ball to reward and train dogs. 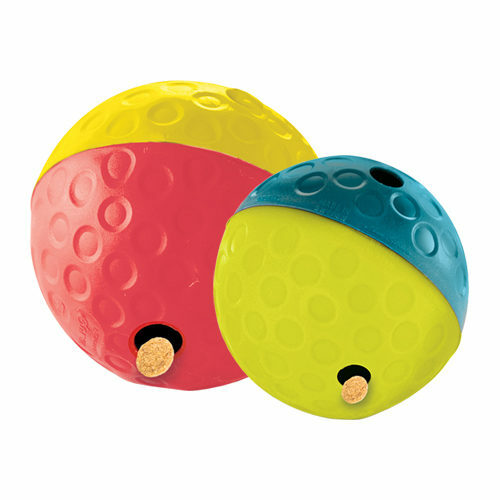 The ball can be filled with something tasty in order to keep your dog actively busy. By entertaining dogs this way, they won't get bored too easily and it enables them to have all the fun they want. The Treat Tumble mentally stimulates dogs to solve problems. This ball also guarantees movement because it rolls in multiple directions. This game can be a fun activity for dogs both indoors and outdoors. The difficulty level is 1 and is ideal for getting your dog used to games and puzzles. For more information about the games from Nina Ottosson, you can go to the brand page. First fill the Nina Ottosson Treat Tumble with the delicious treats. Rattle with the toy to get the attention of your four-legged friend. When you put the ball on the floor and your dog gives a starting signal, your dog may start the game. Reward your dog if he does it right! In the beginning you can also help your dog a bit by showing him how to do it. Is your dog finished? Then stuff the toy again. Your dog will be enthusiastic when he sees it the next time! To make sure the game stays clean and fresh, you can clean it with running warm water and mild soap. Rinse the toy well with clean water after cleaning, so that all soap residue is removed. The Treat Tumble is made from recycled plastic, which is easy to clean with water and soap. After washing this product, always check that no soap residue is left inside. Have you used Nina Ottosson Treat Tumble before? Let us know what you think about this product.